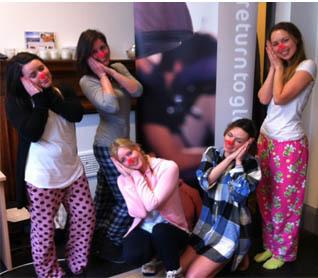 Recently, our office team did their bit for Comic Relief by having a ‘come to work in your pyjamas day’. I led the way and gamely stomped to work in my best jimmie jammies, complete with a pre emptive stony expression to deflect what was sure to be the incredulous stares of fellow commuters. After a few minutes of steadfast refusal to meet anyones gaze I noticed something was not quite right. No one was goggle eyed in amusement, in fact not an eyelid had been batted. First-hand I learnt just how unworried Londoners really are about what you do or what you look like. Buoyed by this first hand discovery and liberated of the anticipated ridicule I had expected my appearance to receive, I trotted into work with my head held high, eager to see if the rest of the team had experienced the same nonchalance on their journeys; only to find that everyone else had chickened out and sneakily slipped on their pj’s upon arrival. Hmmm. By no means defeated I promptly insisted that everyone donate double the agreed amount as punishment for their wussery; pocketing a cool £200 for Comic Relief, and priceless amounts of kudos. Ha.